Today's Advent Word is 'simplify'. This makes me think of all those how-to articles in magazines and blogs, such as '10 steps to simplify your life', 'how to de-clutter your home'. Sometimes trying to do those things turns out to be more complicated than simple. Sometimes we don't want to let go of things or attitudes that get in the way of simple living. That doesn't mean it isn't worth making the effort, especially in the 'run-up to Christmas' when the pressure can be to do more, spend more, work harder to create that illusive 'perfect Christmas'. 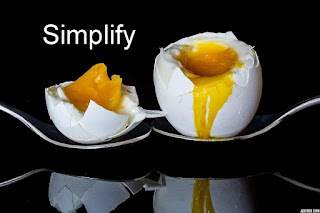 I find the words 'live simply, that others may simply live' a real challenge. The origin of this mandate for living is attributed to a variety of people, including Mahatma Ghandi. Many people in the world have no choice but to live simply when every day is a daily struggle to fetch water and find ways to get just enough food to survive another day. Perhaps one way those of us who have more than we need could simplify such people's lives is to give to organisations like Water Aid. Water Aid works to bring clean water and sanitation within reach of more communities. To simplify can mean to travel lightly. Travelling lightly through life involves learning to appreciate the simple basics that bring joy to life, like clean water and basic food. Jesus teaches his followers to pray each day not for more but for just enough. This is the open secret of what it means to be content and find joy in this life: to realise and appreciate what we have. This line alone is the antidote to the misery created by consumer culture (especially at this time of year)." What food for thought does that word stir up in you?